Old age is not an excuse for skipping fitness. Exercise is for all ages. This is why many experts think that people should train for strength regardless of their age. There’s an appropriate training routine for people of all ages. Some people above 40 or 50 think they are too old to gain muscle and strength, but that’s just not true. You can gain muscle and strength even if you are above 60, maybe a tad slower than young people, but you can go stronger, fitter, and healthier. Even the CDC advocates this workout for senior citizens. Here are several reasons why you should consider strength training. The older you get, the worse your balance gets, and it’s not just because you’re aging. It’s also because we tend to be less active as we get older. That causes us to lose muscle tone and bone density, two things that exercise, particularly strength training, can reverse. Restoring your muscle tone, or at least some of it, can improve your balance and reduce chances of falls and resulting injuries. Adult men and women lose bone mass as they age. This can be prevented, slowed down, or even reversed through proper nutrition and exercise. Strength training, coupled with proper diet, is the best way to avoid losing bone mass and even regain them. By slowing down or reversing bone density loss, you’re reducing the risk of fractures and osteoporosis. The average Joe who doesn’t train for strength loses at least 5 pounds of muscle by the time he’s 30. He would lose 5 pounds more by the time he’s 40. Ten more years, and he would lose another 5 pounds. You lose muscle mass, tone, and strength. You grow weaker and with muscle mass loss follows bone loss as well. You also tend to pack more fat as you lose muscle. Muscle burns calories. The bigger, more active your muscles are, the more calories you burn and the less fat you store. 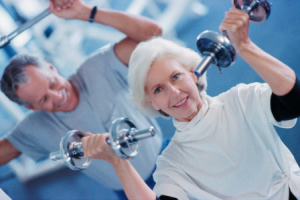 Strength training increases muscle tone and metabolism, and this is true even for seniors past 60. Any form of exercise is good for your heart. Strength training when done at a proper pace trains your cardiopulmonary system and later on improves cardiac health. Because strength training tends to burn fat, your cardiovascular profile improves. It also trains your heart to handle greater physical demands. Strength training has been shown to reduce joint pain in people with arthritis, which is quite a common ailment among the elderly. Unlike running and many cardio exercises, strength training is not a high-impact sport that soon becomes taxing for the joints. Lifting weights or training with resistance strengthens not only the muscles but also the bones, tendons, and joints. Calisthenics, for instance, is a type of strength training that benefits people with joint pains and injuries. The secret is to train according to your strength levels and follow a well-structured program designed for you. The older we are, the more diseases we suffer from. Seniors are more likely to get cardiovascular disease, diabetes, colon problems, sleep disorders, and osteoporosis. Strength training helps you manage chronic disorders and allows you to live a better life. For instance, it allows your body to better control blood sugar and body fat, thus curbing or even reversing the progress of diabetes and cardiovascular disease. Also, any form of exercise helps people sleep better and fight stress, even if it’s just spending time on a vibration machine.